Built 1883-1892 by Siro Borrajo Montenegro and José López Salaberry. Opened 17 Sep 1892 with Meyerbeer's opera "Les Huguenots". Named in honour of the Spanish poet, Ramón de Campoamor y Campoosorio (1817-1901). 1491 seats. 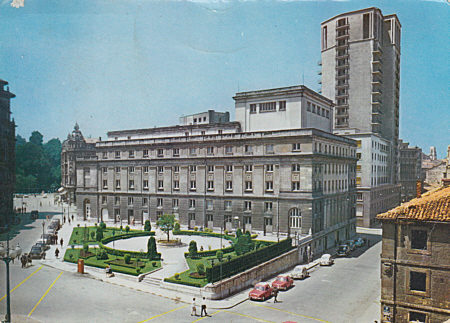 Since 1981, venue of the annual "Premios Principe/Princesa de Asturias" award ceremony. 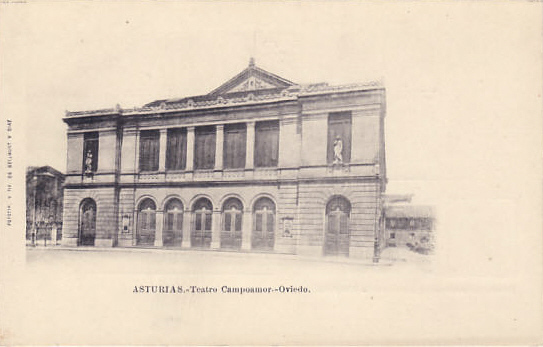 Front Text: "ASTURIAS - Teatro Compoamor - Oviedo"
Reverse Text: "Oviedo. Jardines y Teatro Campoamor. Jardins et Téâtre Campoamor. The Campoamor Theatre and Gardens." Publisher: Ediciones Arribas, Zaragoza; 2.003.